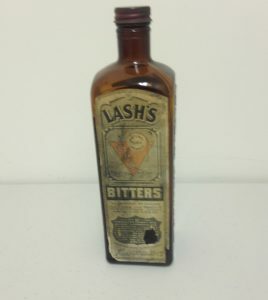 Lash’s Bitters Bottle with full complement of labels and original screw cap. Labels in good condition. No damage to bottle. Nice surviving example. 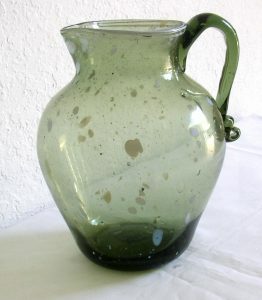 A large (8 1/8″ high) and important free blown English “Nailsea” applied handle pitcher in a striking medium yellow-green with the traditional embedded white spots and applied white trailings on the rim. Robust bulbous form and nicely applied and crimped handle. Large tubular pontil. Normal wear from usage. In excellent original condition with no cracks, stars, chips or the like. 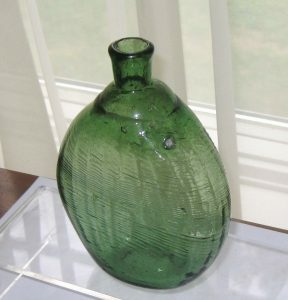 An appealing size and form with the desired crudity of an early example in excellent condition. 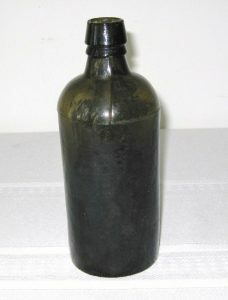 Very nice Midwestern, probably Ohio, “Pitkin” flask with 24 vertical ribs and 24 swirled ribs. Nice medium yellow green color. The glass is clear and brilliant with no damage, body wear, stains or haze. There is an interesting large stone occlusion at the upper shoulder that adds a bit of crudeness to the piece. The occlusion has no radiations, no problems. 5 5/8″ tall. From a New York State collection. 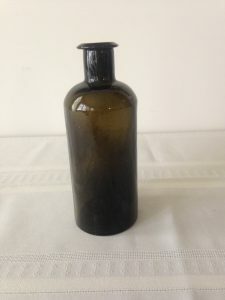 Nice clean, heavy deep olive amber utility bottle. Blown in a 2 part mold with great residual whittle marks in body. Applied lip, raised glass dot in the center of bottom graphite pontil. Clean and brilliant glass. Excellent condition. 7 1/4″ tall, 2 3/4″ diameter. 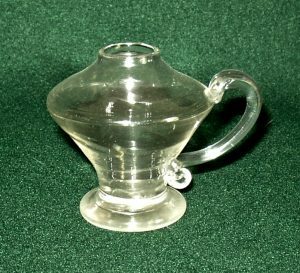 Early 19th C. free blown clear glass sparking lamp with nicely applied ear shaped handle with curled termination. Tool formed funnel shaped body ending in a drawn circular foot. 3″ tall. American origin. Excellent condition with no damage. A little different form of a medical leech bowl. It stands out with a smaller bowl (5 1/2″ diameter) and a more interesting blown 2 ribbed trumpet base than others. Nicely blown bowl and base, both with folded edges. Overall 9″ tall. Excellent original condition with no problems. 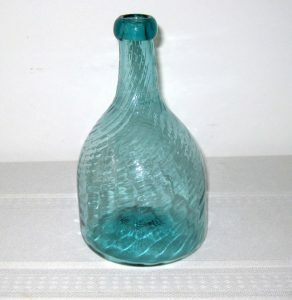 Very attractive pattern molded Club bottle. 24 ribs swirled to the right, Midwestern origin, probably Zanesville Glass Works. Rich medium bluish/green with well formed “beehive” body, bold applied mouth collar, nice push up base and pontil scar. 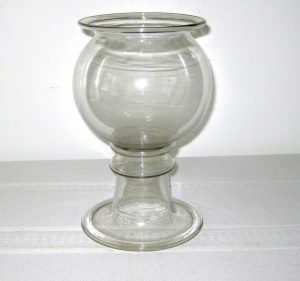 7 3/4″ tall, 4.5″ diameter. Excellent condition with only some very minor haze at the base of the neck. A much stronger color than usual. 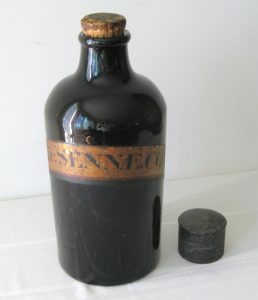 Very large deep olive green apothecary bottle. 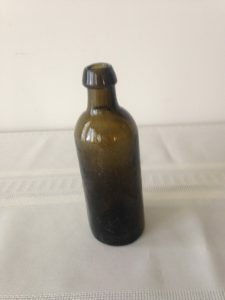 Excellent original condition retaining its original cork and tin cover. Nice gold and black label. Large pontil area. Nice luster to the glass surface.